Products enhancing the human/animal bond. Here’s how the trademarked, Pet Petal Pullcart® works. The body/basket of the cart features holes through which harness connecting rods are placed. 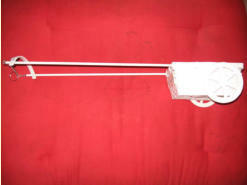 The rods connect the basket portion of the cart to the harness of the animal (which is not included with purchase of cart). Harness rods each slide forward and backward within the holes when the cart is turning. This helps prevent the cart from flipping over if the animal is making a turn. Rectangular paddles are screwed to the wheel axle. When the wheels move as the cart is pulled, the paddles rotate, thereby dispensing flower petals. Some petals drop out of the holes in the bottom of the flower cart basket; others are dispensed over the top. 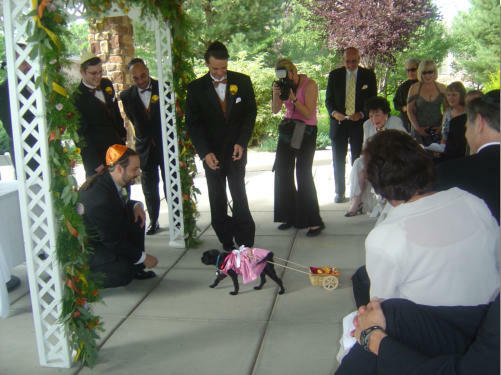 Pet shoulder harnesses commonly include a ring clip on which to attach a leash. 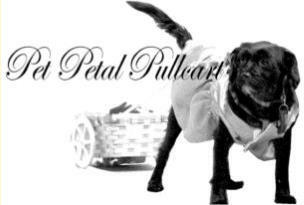 The Pet Petal Pullcart ring attaches to this shoulder harness leash ring clip and slides freely along the chain. When the cart is in position, it should be comfortable for the pet. It is easy both to attach to a harness and to take off. 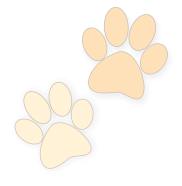 If an animal (dog, cat, ferret) can walk forward in response to treats or to hearing its name, no special training should be required to use the cart.